This batch of rians was the last batch of Luang Por Kasem's Banjahbahramee(prosperity) batch of amulets. They were created to raise fund for the building of a Sala at Susahn Dtailak and also for donations to charity in Lampang province. Besides, the reason of raising fund, Luang Por Kasem wanted very much to create this batch of rians because of a woman called Susahdah. Long time ago, there was a farm girl by the name of Susahdah who lived near Wat Pra Keow. She loved to make merits at the temple and each day without fail, she would bring the fruits that she had harvested at the plantation to the temple and let the monks consumed. There was someone in the village who was very jealous of Susahdah and seeing that Susahdah went to the temple frequently, she spread the most vicious rumours that Susahdah has an affair with the monks in the temple. The villagers were furious when they heard the rumours and wanted to execute Sasahdah. Susahdah pleaded her innocence to the villagers, but no one in the village believed her. Before she was executed, Susahdah made a vow that her chastity was clean and she made a curse at the person who spread the rumours. A curse which would last for generations and generations that the vicious person and her families would never be prosperous and would lead the life of a pauper forever. Luang Por Kasem came to know about this sad story of Susahdah and wanted to make merit for Susahdah, and hoped that by doing so, could remove the curse of Susahdah. Before the rians were created, Luang Por Kasem's disciples asked him what shape of this batch of rians that Luang Por Kasem wanted them to be. 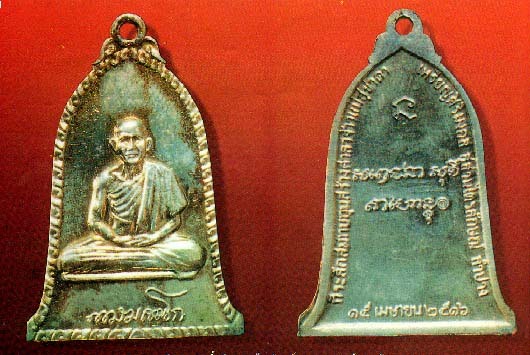 Luang Por Kasem asked them to create them in the shape of a Rakang(Bell). Luang Por Kasem said that since Rakang produces a loud sound (Dang), he wanted this batch of rians to be Dang, which mean popular in Thai. The person who wears it would become Dang (loud), meaning become popular and prosper as well. A total of 84,000 pieces of Neua Torng Daeng Rum Dtum (Copper) and 200 pieces of Neua Ngern(Silver) were created and chanted in BE2516. This batch of rians is very Dang (popular) in Thailand, and although a large quantity was created, this batch of rians are always in demand because of the good reasons that they were chanted and the many good experiences that were encountered by people who wear this rian. A good condition piece of Neua Torng Daeng Rum Dtum can easily cost 10,000 bahts.